Having trouble garnering engagement for your branded social media? Getting minimal likes and shares for your posts? Maybe it’s time to re-evaluate your social media strategy. 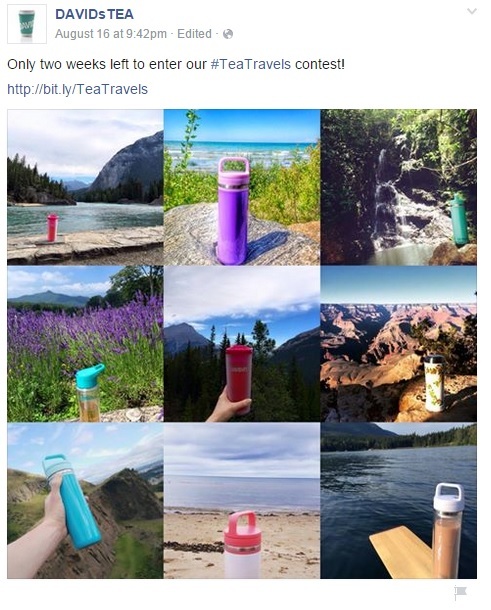 Here’s a few easy tips to help you improve your company’s Facebook posts. Let your company’s blog post serve as a ‘central station’ for all your social media content. Creating a thoughtful, informative and well-written blog post will generate engagement, and create interest or excitement. Creating blog posts that offer new and innovative tips that can help your audience in their everyday life have proven to yield the most predictably reliable results. 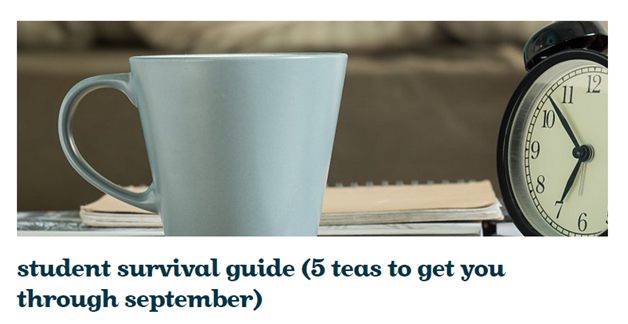 For example, DAVIDs TEA created the ‘Student Survival Guide (5 teas to get your through September)’ just in time for back to school. Their post provides tips and recommendations for the right tea to help with every adjustment, from waking up early, to studying and more (visit article here: http://bit.ly/1KQChMN). Once your blog post is completed, you can now leverage it to generate social media snippets, that drive social media audiences to your website. An Announcement Post – Create a simple post, a 30-character maximum headline inviting your audience to check out your new blog post and WHY. Include a link URL to the new blog post (preferably shortened), and a relevant, high quality image. Ideally the Facebook post will pull this image from your blog post. Snackable Post – Give your audience a sneak peak about what your blog post is about. 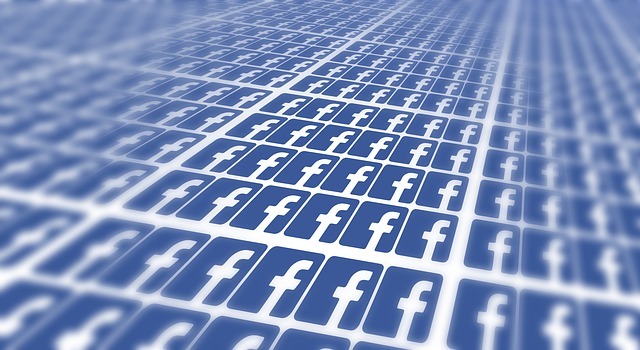 Extract interesting tidbits from your blog post to construct Facebook posts. Tidbits can take the form of tip, fact or leading question, where your audience can find the answer in your blog post. 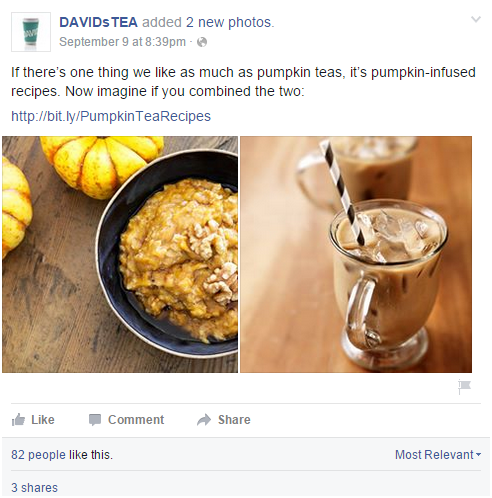 DAVID’s TEA did a great job creating interest and giving their audience a compelling reason to view their recipe blog with this Facebook post. Your image should generate interest, an emotion or curiosity. It must also be relevant to your content. 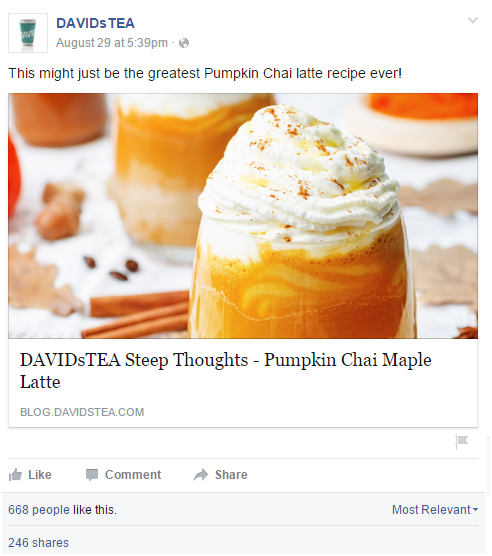 DAVIDs TEA did an excellent job creating a snackable post linking to their “Pumpkin Chai Maple Latte” blog post. The used a beautiful fall themed close-up of the finished beverage to illustrate the coming and excitement for the Fall season. Consider doubling up by using a caption on your image, to grab attention and drive home your message immediately. The other benefit of using link shorteners like Bit.ly is the ability to review how many clicks your bit.ly link received, and use that knowledge to inform your next choices for posts. Check out bit.ly here to give it a try: https://bitly.com/ and learn more. One of the most important and, often overlooked, considerations to posting on Facebook is the time you post. Utilising Facebook Insights or other analytical tools such as Sprout Social can tell you when your audience is online, including time and day of week, and how much of your fan base is online per day. We recommend to create a general chart of the best posting times, and keep it handy to help you easily schedule your posts for the most effective results. Also don’t forget to stay on top of holidays and special events that are relevant to your business. DAVID’sTEA did a fun and creative post of one of their products for Halloween!